Charts say the stock, which closed Friday at $46.99, shouldn't fall beyond around $45. 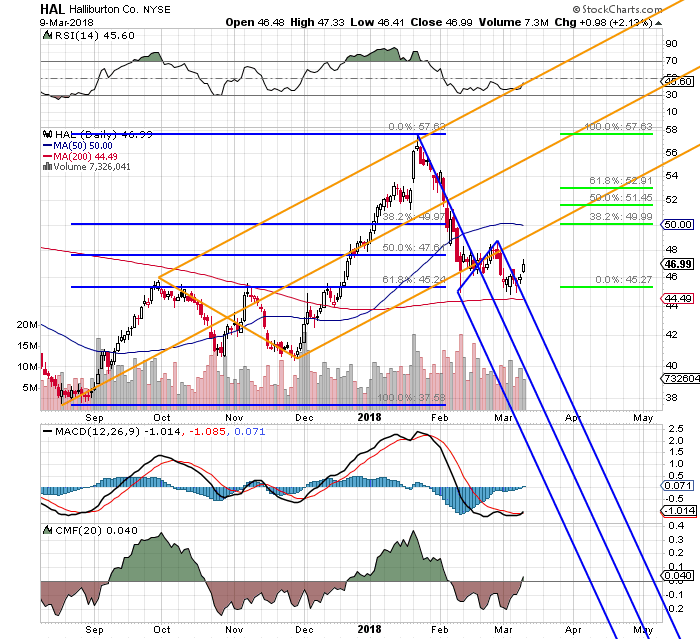 Some of you might remember that I charted Halliburton (HAL - Get Report) back a few weeks ago. I've also thrown in another Pitchfork pattern in blue, which covers the stock's current downtrend. I wanted to show you just how unsustainable that trend is (in my opinion). What has worked like a charm has been support around $45.25, which also happens to be a 61.8% retracement of Halliburton's September-to-January move. That level has worked twice now, and Halliburton closed on Friday at $46.99. We can also see that Halliburton Relative Strength Index (marked "RSI" at the top above) and Chaikin Money Flow (denoted with a "CMF" at the bottom) are starting to work. The daily Moving Average Convergence Divergence indicator ("MACD") is emitting a positive signal as well. However, with two of the three exponential moving averages (EMAs) sporting minus signs, I'll take all of the above with a grain of salt. Still, let's go back to the Fibs, because they're working. If we run the model from Halliburton's January highs through its double-bottom lows, then we'll see a primary target retracement (31.8%) at roughly $50. But if the pattern actually works in reverse, we could be looking at prices in the $52.90 range. That's all well and good, but first we have to figure out where to increase our exposure. Did we miss that $45.25 level? If we did, the stock's 200-day simple moving average (the red line above) is still running at $44.50. So even on a breakdown, I'm likely to pick up tranches at those prices. While I bide my time waiting for that opportunity, $45 puts expiring on April 20 were still paying 84 cents as of Friday night. That at least puts my entry point closer to 44 bucks if I get run over. If not, I keep the 84 clams. At the time of publication, Guilfoyle was long HAL, although positions may change at any time.